Nightingale takes at-home white noise to a whole new level. Designed by acoustic experts and leaders in sound masking, Nightingale is the first smart sleep system for your home. Nightingale plugs right into the wall of your bedroom and delivers white noise customized for your room's unique architecture and acoustics. That means the sound can be tailored for your specific sleeping situations, such as tinnitus and snoring from adjacent rooms. All it takes is two units to immerse the bedroom with one of 15 different sound blankets. With Nightingale, you'll sleep better every night. A new study has shown that Nightingale helps people fall asleep 38% faster - that's about the same effectiveness as commonly prescribed sleep medications. As you probably already know, getting better sleep can be a big challenge. Nightingale rises to the occasion, improving sleep quality by masking common indoor and outdoor noises. The noise masking is smart, customized, and effective like no other consumer white noise machine. Less noisy disruptions means better, deeper sleep. Imagine waking up feeling refreshed again. Nightingale could make that possible, putting both pure white noise for sleep and soothing nature sounds to promote relaxation at your fingertips. Nightingale is ready and awaiting your instructions: it is voice alert and IFTTT enabled, and you can control it via Wi-Fi from the Nightingale iOS or Android App, or any web browser. The system also integrates with popular smart home appliances like Amazon Alexa, Nest, and Ring. Automatic scheduling even turns the white noise blanket on before bedtime, and turns it off before you wake up. Nightingale is as convenient as it is smart. 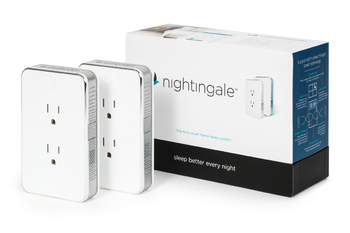 Nightingale units feature pass through outlets so your white noise won't max out your plug-ins. The units are also compact and low-profile, so they fit invisibly behind furniture. Alternatively, you can turn on the multicolored LED lights on each unit to add a soft, comforting glow to your bedroom. Choose Nightingale - Sleep Better Every Night.